WASHINGTON – After ruling that the so-called religious beliefs of corporations (SLOBBY LOBBY eg.) will now take precedence over the human rights of flesh-and-blood citizens, the Banana Republican males on the Supreme Court announced that this branch of government will undergo a name change. 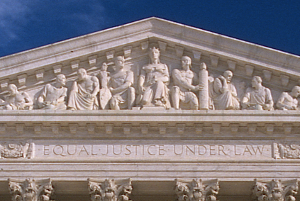 In keeping with the absolutist conservative views this court now holds, in the future, it will be called “The Supreme Court Of The United Corporations.” Since they have perpetuated the fiction that corporations are people for this long, they are ready to take the next step. The interests of corporations will be the only “rights” considered in any case involving corporations. Associate Justice Samuel SCALITO did however state that in the unlikely event they were ever forced to hear another case involving only natural citizens, and if the facts of the case would not enable them to transfer any tangible right from a human being to a corporation, there is a slight possiblity that they might rule on the merits of the case. He then quickly added, “But, don’t hold your breath.” Well, at the very least, one Washington institution has finally decided to stop concealing its true agenda. 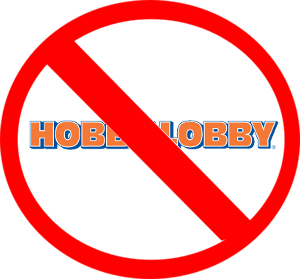 WASHINGTON – Although it is unclear exactly what a SLOBBY LOBBY is or what sort of trash it sells, it is beholden upon all Amercians who still believe in the First Amendment to boycott it! More guns! More killing! More, more, more! LAS VEGAS – As the psychotic CEO of the NRA, Wayne LaPierre, celebrates another triumph of his dystopian world view here, we finally have the evidence that his theory is provably false. Two of his favorite gun nuts, Jerad and Amanda Miller, who gained some notoriety as defenders of the racist cattle rancher, Cliven Bundy, caught stealing grazing land from the Federal Government, decided it was time to start a “revolution.” So, armed to the teeth, they went on a shooting rampage. Remember, this is the exact scenario that LaPierre advocates as the true American Dream. They stopped in a CiCi’s Pizza where two police officers, Igor Soldo and Alyn Beck, were eating. They were both “good guys with guns.” They were both murdered in cold blood. The couple next went to a Wal-Mart and told people to leave. Every unarmed person in the store went unharmed. However, inside the store, another “good guy with a gun,” Joseph Wilcox (why bringing a concealed weapon on a shopping trip qualifies one as “good” has not been explained by anyone yet) tried to stop the “bad guy with a gun” only to be shot in the back by the “bad gal with a gun.” The bad gal subsequently stopped the bad guy by shooting her husband, and then she stopped the bad gal by shooting herself. So, there it is laid out incontrovertibly. 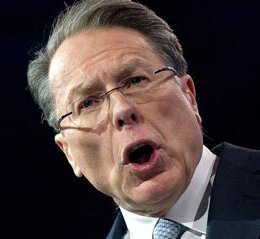 LaPierre’s mantra has always been, “the only thing that can stop a bad guy with a gun is a good guy with a gun.” Not true. In fact, three good guys with guns were killed, and none of them was able to stop the bad guys. Wrong, wrong, dead wrong. So, why didn’t we leave him behind? 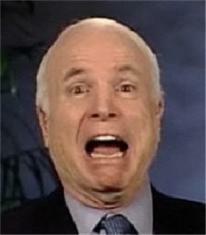 WASHINGTON – Presidential loser and perpetually angry Senatorial crank, YAWN McLAME is shaking his fist in rage again. This time, he has an objection to bringing home a PoW from Afghanistan, Bowe Bergdahl. Yes, the “War Hero” whose only heroic achievement was actually getting captured in Viet Nam — who also went out of his way to cover up the fact that other PoWs were in fact left to die in captivity in Viet Nam — has decided to weigh in on the wrong side of yet another PoW issue. Strangely, he used to support the return of Bergdahl, but as soon as President Barack Obama negotiated his release, McLAME flip-flopped on the issue. So, considering how strongly he feels about leaving other Americans behind after wars are over, why hasn’t he volunteered to return to his prison camp in Viet Nam? He had to work at it, but he really has reached a new low. He should be proud. Eric CANTWIN Can’t Win Against A Tea Bagger! 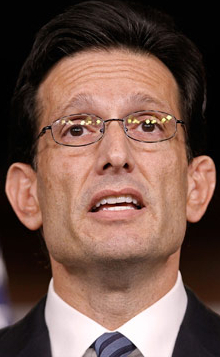 RICHMOND – In a further act of Banana Republican self-destruction, Virginian bigots Primaried one of their own today. The House Majority Leader and all-around douchebag — someone renowned for his dislike of poor and middle-class people — just couldn’t bring the hate like he used to and was trounced by a Tea Bagger freshly filled with anti-immigrant vitriol, David “No Relation” Brat. Too bad. Adios, you will not be missed!